Interview with Chris Chavez. "All I teach - are the tools to connect with The True-Self"
Chris Chavez first began the practice of Iyengar Yoga in Ireland, where he was touring as a professional musician in the mid 1990’s. While traversing the globe playing music and studying various other methods of yoga, Chris imparted the knowledge and the gift of yoga upon everyone he met. In 2001, Chris landed in Los Angeles, California, where he submerged himself into the practice and study of yoga and began to teach and build community. Certified as an Anusara Instructor between 2006 and 2012, Chris is known for his extensive studies, his vast working knowledge of the mind and body, and his great personable demeanor. Chris is considered one of the most sought after teachers in the world, training thousands of teachers and students a year in North America, Europe, and Asia. 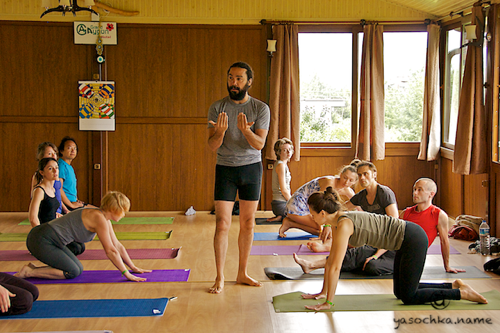 Chris’ world travels and experiences have made him one of the most down to earth yoga teachers you will ever meet. His teachings are fun, challenging, and spiritually uplifting. Chris has found the power of practicing and teaching yoga to be an integral part of being a great artist as he continues to maintain a healthy music career and a rockin’ yoga practice! "All I teach - are the tools to connect with The True-Self"
Let’s start from the beginning: how did you find yoga for yourself and how did you start your practice, how did you become interested in yoga? I first started practicing yoga when I was traveling around the world, playing music. I was living in Ireland with another musician, who was also an Iyengar teacher. He was practicing yoga every day and everyday he would say: ok, you have to leave the house while I practice. One day he said: you look like a yogi, you should practice yoga, I said: ok, show me what it is. So he showed me five poses like Utkatasana, Bhujangasana, Sarvangasana - very basic poses. So every day I’m doing these five poses, I think: ok, yoga is very easy. Everyday I’m traveling, playing music, and practicing this yoga. And slowly, over a period of time I start to meet other yogis, get to know that they are doing more poses, and I think: aha, maybe there is more in yoga than just five poses. So, I’ve started to look for yoga studios and look for classes. Then, when I’ve moved to Los Angeles, I lived right across the street from a yoga studio. I was practicing every day and then after practice I would go home and practice some more. Soon, some friends asked me, if I would share what I know - would I teach them. I said: yes, sure! So, that’s how it started. I started practicing yoga in 1993. So, almost twenty years. But I think you have a rock-n-roll life style, isn’t it boring for you to practice Iyengar yoga? To stay for a long time in one posture? Well, even when I was playing music, I was quite disciplined. I mean, I used to live by myself in London, I moved to London to play music. At that time I became vegetarian. I was meditating but I didn’t know how to meditate, I would just light a candle and sit in my room, and just watch the candle, so I was a kind of already drawn to this type of lifestyle. When I came across yoga, the lifestyle just fit, I wasn’t drinking alcohol or anything at that time so I was quite disciplined and discipline helped me even to cultivate my music. I was not like a typical rock-n-roller - I would be rather drinking orange juice at concerts. But it complemented really well, especially the traveling. Because you are always moving from city to city, playing music and the energy and lifestyle make you uprooted and you need something to ground you. And yoga, I mean, even though it was just doing five poses, it was very much the discipline of doing that which helped to keep me grounded and focused. Usually people start doing yoga for two main reasons: either to improve their health, or, if they look for some inner transformation, to change their mind or to change their lifestyle, something like this. Even sometimes they would like to reduce some suffering and so on. In your story did you feel some inner transformation? There was an increase of energy, it is easy to understand, because a lot of people, who live in big cities, they feel less prana. And in good environment they want to recharge some energy. But what about more subtle things? I think also that one of the things is that we all look for transformation in many different levels, whether it’s physical, mental, or even spiritual. Part of my journey was a calling for that transformation; even though I did not know what it was. But that calling was there, probably from a very young age. And when I came across yoga it was almost as if yoga was the tool that was given to me to say: hey, you are on this path you are making this transformation now here is a tool to guide you in that transformation. It’s almost as if you are trying to build a house and somebody gives you a hammer. Oh, that is so much easier, this makes sense now! And when I came across the tool it was almost like: yes, of course it makes sense, and it fit with me very quickly. I’m not sure exactly what kind of transformation I was looking for at that time. I don’t think it was so much of a physical transformation I was looking for because I was quite physically disciplined already, I was running, doing exercises, etc. It was probably more about the mental and spiritual transformation that attracted me to yoga. Now, I’ve been able to also find this through the physical, so I would say that yoga became a kind of a doorway to transformation and the practice was the key! It just resonated with me for some reason. I was lucky to come across that musician. And now you are teaching your own approach to practice, but I think you have, like all yoga teachers have, some roots in some different styles, schools. Can you tell which style had impact on you, from what school or tradition you picked up the techniques? Most of what comes out very strongly when I teach is my bio-mechanical knowledge, as far as alignment and stuff like that with the body. But I think that has very deep roots in Iyengar yoga because the teacher that I studied from for many years came from Iyengar system as well. John Friend was a high level Iyengar teacher. In my beginning I studied Iyengar, then I went to Ashtanga for a while and I visited Vinyasa power classes all over Los Angeles and eventually I got to practice Anusara. It was a pretty cool system that provided solid bio-mechanical tools; the tools were super effective in opening up the body and making you feel good in the practice. What I found out later was that much of the techniques came from Iyengar. If you look at Iyengar’s teachings, you see that much of the same stuff was still there, perhaps it can be seen as an evolution or even a condensation of what works. So I studied Anusara for twelve years and I taught it for probably seven of those twelve years or more. And over the last year I’ve left that system and what I’m mainly focusing now is using what I’ve learned in all areas of my yoga experience to just teach yoga. I mean for me the primary teaching is not about building a system or brand, but it’s about getting each teacher and each student to just know themselves more fully. And if I had to say what is the one teaching that I like to bring out of all teachings it’s very simply, it’s The True-Self. It’s a way of exploring Who are you? Why are you here? What is your Truth? How do you express your Truth? We can use the practice to get in touch with that. So everything I teach can basically be used as tools to connect with The True-Self. Obviously the biomechanical tools help us to access the qualities of The True-Self which are: mind body, heart or more specifically open heart, clear mind, and free body. If we can connect to those three components in our practice then it can act as a guide that will lead us towards our True-Self. I think, knowledge is something that is a very tricky, because especially as yoga teachers we are always reaching for knowledge, wanting to learn more. Lately I’m asking myself the question like, why? What are you going to use it for, this knowledge? How can you use it? And if you can very simply use it to connect to your True-Self then our job is done! Does that make sense? Yes, very interesting. Did you study from Indian teachers, may be in India? What do you think about the difference between Indian yoga and western yoga? Because now we can see that these are may be two parallel or even different teachings? Yes, I would say that they are parallel. One of the things that is interesting is that western culture as a whole is very innovative. They are always looking to take something and evolve it and to eventually make it their own in a way that is accessible to the public. Indian yoga is still very much connected to the roots of scripture and may not always be appealing to the average person. It’s hard to say whether the one is better than the other. Yes, lifestyle is different, problems are different, attention spent is different, different health issues, even different desires, most people that practice yoga in North America they start out, as you say, for the physical effects of it, which I don’t necessarily think is bad, I think that probably more people are practicing yoga right now, more than ever. Yes, much more than in India. I sometimes teach at big corporate yoga studios or big institutions and I have heard other yogis ask: oh, isn’t that corporate yoga? And I say yes, but at the same time they are getting yoga out to thousands of people that would never do it otherwise. These big companies can offer yoga in these packages that are easy and attractive for an average person to try, so you find people saying: oh, that’s easy, I can do that. And maybe out of those thousands of people maybe ten percent want more, but that ten percent would not be there if it had not spread the way it is. So it does have some downside to it but also has some big upside too. And hopefully as we get more these people wanting to make this inner journey, this inner transformation we can even use the power of technology, use this power of marketing to spread it more around the world. It is interesting and I’m not sure exactly if one is better than the other. I think it’s not a question that something is better or not, it’s just a difference, the world is different, and we have a lot of colors in the world. It’s awesome, because I see these Indian teachers that we are bringing here, they have the opportunity now to come out of India, and share their teaching with the world. The big yoga studios, through their teacher trainings, have established a demand for the traditional teachings. The demand for these teachers is higher now, and they can come now and have an effect on a bigger level instead of just teaching to the few students that can travel all the way to India to see them; now you bring them out of India and expose them to hundreds of people, and even thousands of people over a year or something, that’s a pretty big deal! So, I think there is actually harmony to be found in it. You are traveling a lot, you are teaching in different countries, in different places. You can feel different impression from different places. For example, people from different countries have some different mentality, or culture, they accept yoga in their own manner. Can you tell some interesting things about how you compare impressions from different countries, from different people? For example, in Asia, in western countries, in Europe, in North America, I think they have some difference, it’s interesting. Yes, there is a lot of difference, what’s fascinating is even though there is a difference, there is also a common thread that connects everyone that comes to yoga and it’s the desire to transform. The tools they use to make that transformation may be different, but the goal is the same. In North America it’s a physical transformation that most people are looking for. When you come to a teacher training, for example, or even workshops, what most students want to see is how can you expand their practice, how can you make their physical practice deeper. It’s through the physical practice that they get this vibration and they get this: wow, it makes me feel good, or, wow, my mind now feels so much better, when I practice really hard. In Europe, for example, especially like here in Turkey, there is already a strong rooted sense of spirituality within this religious country, so they want the physical, but they also want to know the spiritual, they want to know the different side. So, it is not always necessary to go so hard into the physical aspect quickly, you can back up a little bit and give them something else. In Central Europe it’s the mind. I teach a lot in Switzerland and there are highly stressed people, they work very hard, and they are always chasing something but they don’t know what it is. They are chasing perfection actually. They need a break from their own mind. There’s the physical practice, they love it, there’s spiritual aspect, that’s cool, but can you stop that damn mind!? When you give them a little bit of that, it is just gold for them... that’s what they want. It’s in these three areas of our lives that we all seek transformation and so the journey can be physical, spiritual, or mental. And my job, I guess, is to go in there and feel what they need, give them that and then find ways to give them much more; go to the one thing that they are hungry for and say, here it is... and then, use that as a doorway to open up their world to so much more. It is very interesting because in Russia most of the people think that Switzerland is extremely wealthy country, people live like in paradise there. It is a very wealthy country, but it is a very wealthy country because there they are all working very, very hard to be secure or to be the best. Eventually, that can become very suffocating, it’s like work, work, work, go to work, be successful, and the spirit is getting pushed down. A very simple question that I asked on teaching trainings: what are the things that make you happy? I had many people on trainings that started crying, because they had never asked themselves that question, and when you ask them that question they get even emotionally upset with themselves, why would I never asked myself this question? Why am I not doing what makes me happy? And they can immediately see this gap between this inner knowing and the outer doing. They say: I know there is something true for me but I’ve never even looked at it, have never expressed it, I’ve kept it closed. So, it’s quite fascinating to get people to ask these questions, and hopefully these questions don’t cause stress in their life but really get them to ask, what makes me happy, can I do more of what makes me happy? And what I’ve actually found is that when people can answer this truthfully it’s very simple stuff, and they realize that what makes them happy, they already have in their life, it’s just an aspect of now integrating it or even appreciating it. To think, wow, actually I am happy, I can be happy. It’s fascinating... most of us do not allow ourselves to think or even feel this. And a little bit about spirituality, may be you like some spiritual books or scriptures, or may be you use some scriptures in your teachings, when you teach theoretical part of your lessons. I do. Originally, especially when I was teaching Anusara, the primary focus was on tantra yoga, so I would cover Upanishads or Bhagavat Gita, and classical yoga stuff like this, I would cover more about the difference: this is how it’s different to tantra. But now when I’ve separated from the system I’m going back to just being open to all teachings, and I’m looking at all scriptures and I’m saying: ok, all of these scriptures are guiding towards the same place, it’s almost like using them as different tools - instead of a hammer you have a saw. But the goal is to understand what I really want from this tool. And now I’m going back, and this year I reread Upanishads twice, two really different interpretations of Upanishads. I’m reading the teachings of the Buddha, and I really resonate with these teachings and I feel like from the very beginning much of what I’m teaching now is more related to that than to some of the tantric philosophy, Shiva – Shakti and stuff like this. Although, it’s cool too, and I’ve implemented it but if I go back and I say, what is my true teaching, I would say it resonates more with something that the Buddha would be teaching or what came out of the Upanishads. But I find value in all of it and I don’t discredit anything by saying: you know, Advaita Vedanta is not as good as tantra. Now I’m trying to look at all of it and say, what was he potentially trying to do, where was he going, what was the road map? And the same with the Buddha, and I try to see similarities instead of differences. And in that sense, I can use these teachings as tools to share what I have inside with other people. The teachings of the Buddha have been inspiring my teachings lately, that’s what I’ve been inspired by during the last year. For many years I was teaching primarily tantric philosophy and I was closed to other stuff, I was closing myself off, saying ok this is the teaching of the system and I’m focused on this. And then I’ve started to come across other yoga teachers and practitioners, and they were studying other philosophy, they have a good point of view as well. Now I’m stepping back, saying: let me figure out how to incorporate all of it, share with people and let people to take what they need or what they want. Because if you take any brand it automatically has some borders in its philosophy. If someone creates a brand, creates a system, he puts some borders also. Even in Anusara yoga, it is just my opinion, we could not say it is a traditional Indian tantra, it is some constructed system, which took some ideas from tantra and created some new ideology to use it in the United States for American mentality and so on. Yes, to make it accessible. I think that was kind of what made it appealing to most people. I think probably one of the issues with systematic or brand teaching is that you have to put borders on it in order to control the integrity of the core teachings. To some degree, there is value in having structure. By saying this is the system, this is what it looks like, this is what it teaches, and then as soon as you start to go out of its borders, then it either becomes general yoga, which can then be less powerful as a brand. My focus now is on the tools that I teach, I want people to take them and use them for whatever they want to use them for. If you are going teach Ashtanga yoga you go teach Ashtanga, if you don’t want to teach yoga at all, you want to become a gardener, a master, a chef, hopefully what I teach will guide you to build a connection to that. Because there are yogis all around us, many yogis who’ve never been on a yoga mat, they are connected with their spirit, and spirit comes out of what they do. I think that’s the highest form of yoga. What we are all trying to do is to get to our spirit and bring that out in this life, and I see it in many people. If they can take even this one thing, that I show them, and say: hey, this guided me in that direction, and then I’m happy. 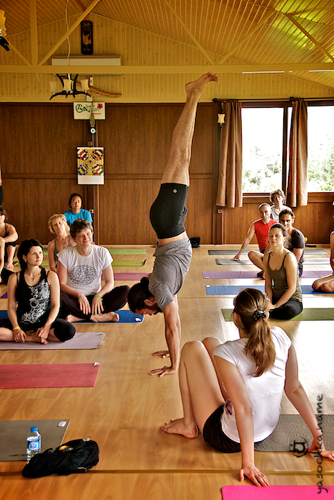 And the last question - what are your impressions about this yoga Rainbow festival, Russian yoga students? I was absolutely amazed and impressed. One of the things, I have never seen, at least not in such a volume, is their search for knowledge, a deep sense of curiosity and desire to learn, and I found it fascinating. I think it was awesome event to bring teachings together from different styles, even different ideologies, and different ways of teaching. The students were able to look at all of it and take something from everyone. I saw the students who were going to every single class, that absolutely amazed me! It’s fascinating. And even their questions after class, they want to know more. And with the demographic, it’s very mixed. I’ve never seen this many men in a yoga class, workshop, training, or festival. It’s predominantly, especially in Northern America, women students. But the level of studentship is really high and it’s really impressive. And a very high level of dedication as well and discipline. It was really nice to teach them, they are very open in their hearts and their minds. I did joke a lot when I was teaching that’s just how I am, and they laughed, so it’s good (laughs). Ok, thank you, so see you in Russia.